I had been looking forward to seeing the exhibition Contour Scribes – Drawing in Ancient Egypt at the Cinquantenaire Museum in Brussels on this autumn. This is a lovely museum that I used to visit regularly, drawing from its collection often a number of years ago. I managed to visit just before the new year and was so pleased that I did. 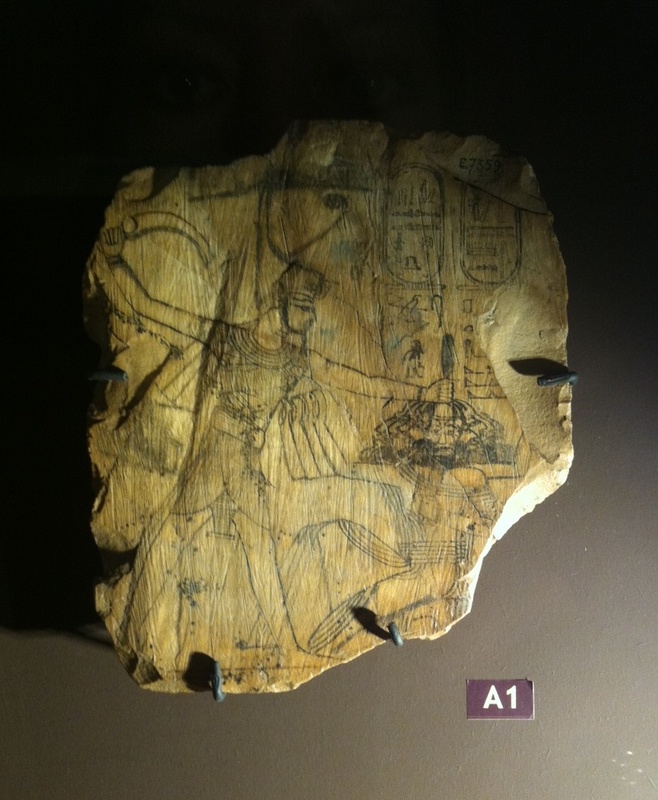 This exhibition which had it’s first showing at the Musee du Louvre earlier in the year, brings together many wonderful examples of drawing from ancient times, made directly onto limestone, terracotta, linen, leather, wood and papyrus. It explores the notion of Art in Ancient Egypt, presenting the creators of these artifacts stretching back over three millennia with the status of Artist as the exhibition Ice Age Art at the British Museum early in 2013 sought to do with the European artists from so long ago. “He who masters drawing will attain perfection in each of these arts”. The quality of the examples of drawing we see throughout this exhibition perfectly illustrate the archaeological legacy left by the Pharaonic era and of the presence of drawing in the life of these ancient Egyptians. 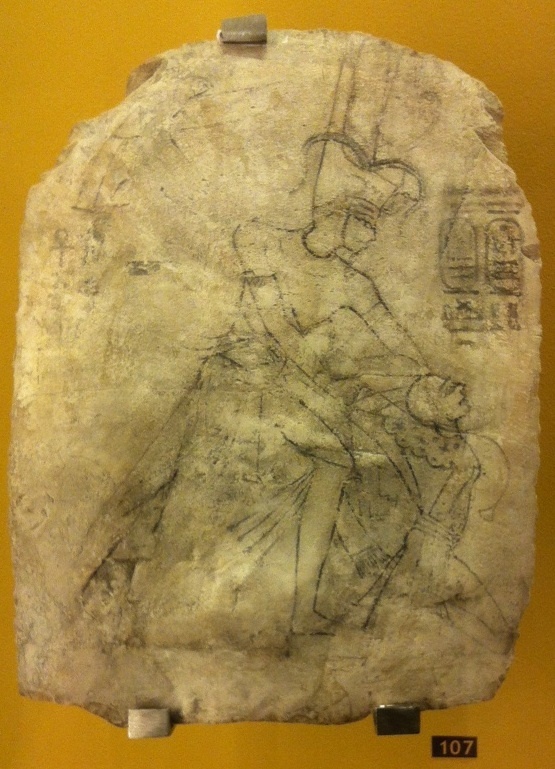 We see in the examples bellow the quality of drawing made at this time, the Egyptians excelling at clarity, showing an elegance and economy of line. Some of these seem to be executed rapidly, while others are far more detailed and have been laboured over. Here we see pieces made in study, in preparation for other works but also importantly “drawing for drawings sake”. This exquisite profile of the Phoroah is painted in red ochre, with fine black overlaid in areas. This profile line has such an elegance, something that these ancient artists excelled at. On the reverse of this piece of limestone there is a study of a python also made in red ochre. The majority of the images in the exhibition are drawings made on flat, or fairly flattish surfaces. In some cases the drawing in paint has been laid over an incised line cut into the stone surface or painted over a low-relief carved surface. The drawing we see here made on limestone demonstrates the same energy and fluency of line as if drawn on charcoal on a smooth cartridge paper. I wonder just how long I would manage with one of these? 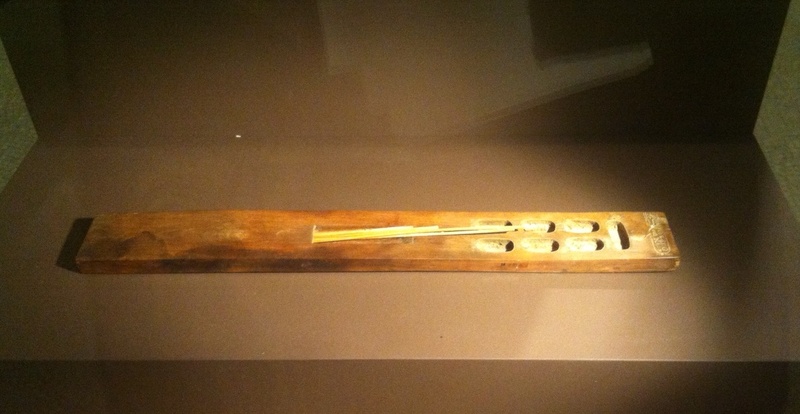 An ancient Egyptian’s palette was tiny, a rectangular piece of wood that had a number of recesses at one end which held the paint. The palette also contained the brushes which are fine reed stems. These would be chewed at one end to hold the paint more successfully and would result in a more fluid stroke. Dry cakes of colour would then be placed in the recesses on the palette. Pigments were ground into powder as they have been for centuries using a pestle and mortar. The pigments were mixed with water in either small pots or using fragments of broken pottery, ideal as the curvature of the fragments would hold the paint mix well. Vegetable fibres tied in bundles were used for mixing. 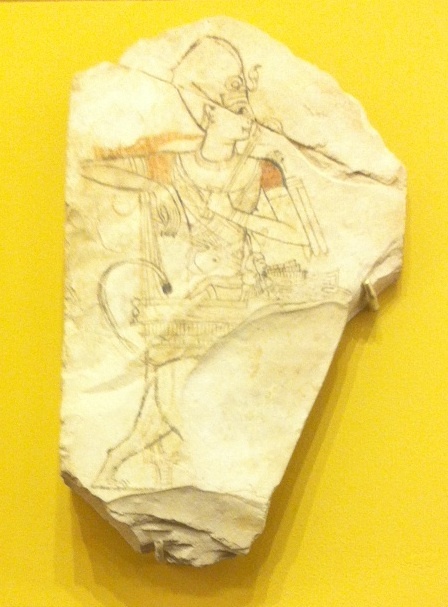 This was a thought-provoking exhibition showing not only the extraordinary quality of draftsmanship, but the importance of drawing in preparation for the bas-relief sculptures on temples, tombs and steles providing so beautifully the regularity, harmony and balance seen in the art of Ancient Egypt. The exhibition continues at the Cinquantenaire Museum Brussels until 19th January 2014. 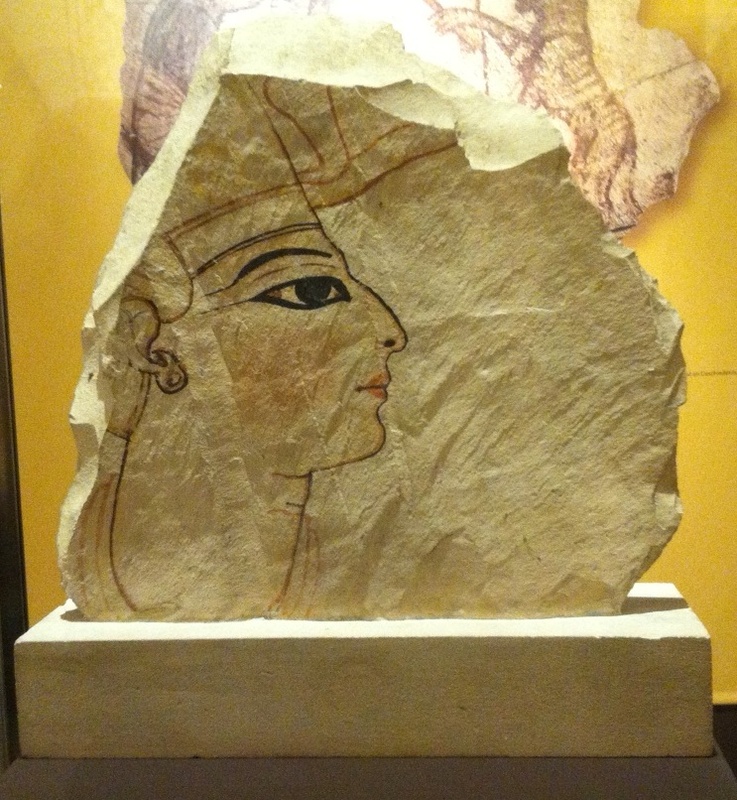 This entry was posted in British Museum, Drawing, Egyptian Portraits, Exhibition, Neues Museum Berlin, Painting, Petrie Museum of Egyptian Archaeology, Uncategorized and tagged Ancient Egypt, ancient Egyptians, arts, British Museum, Cinquantenaire Museum, drawing, Egyptian portraits, Musee du Louvre, paint application, painting, Petrie Museum. Bookmark the permalink.